We have been blogging about damaging changes being made to the Environmental Protection Agency’s (EPA) new chemicals review program for some time. Despite the reforms made in 2016 under the Lautenberg Act that were intended to significantly strengthen new chemical reviews, Scott Pruitt’s EPA has been moving since August of last year to seriously weaken the program. Late yesterday, EPA made a change to its new chemicals website that not only reverses changes made to implement the Lautenberg Act, but actually makes the site less transparent than it has been for decades. EPA’s intent is now quite clear: to prevent the public from knowing when EPA’s professional staff flagged any concern in their initial review of a new chemical. The change makes clear that the agency is now planning to cover its tracks as it weakens new chemical reviews: EPA will now hide from the public any information about whether its initial review of a new chemical raises any concerns or warrants a more extensive review. Is this what Scott Pruitt meant when he said he intended to bring increased “transparency” to the review program – a term he used no fewer than five times in his August news release previewing changes he was making? For decades EPA has maintained a public website that tracks the “premanufacture notifications” (PMNs) companies must submit to EPA in advance of commencing manufacture of a new chemical. (PMNs and accompanying materials are what EPA reviews when evaluating a new chemical’s potential risks.) 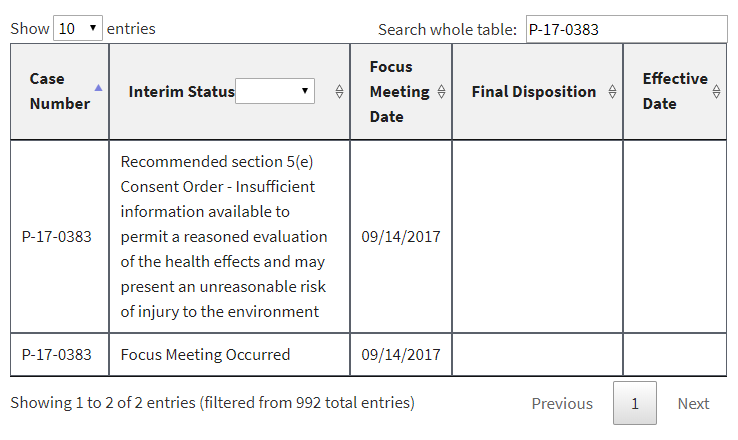 Anyone could enter a PMN number on this website and quickly find out whether EPA had yet held what it calls a “focus meeting” that typically occurs within a few weeks of PMN submission, and if so, what its “interim” decision on that new chemical was. As called for under the law, those interim decisions can range from a recommended “not likely to present an unreasonable risk” determination, to a recommendation to pursue a consent order where EPA either has insufficient information or finds that the new chemical “may present an unreasonable risk.” The interim status might also indicate the chemical warrants a more extensive review (termed by EPA “pending standard review”), that the PMN has been withdrawn by the submitter, or that the PMN has been deemed “invalid” by EPA. This website has for years been the only means by which members of the public could gain any understanding of whether EPA’s initial review of a new chemical flagged any concerns or not. After passage of the Lautenberg Act, EPA initially enhanced the functionality of the website, including by indicating whether a final action had been taken and providing a link to certain documents related to those final actions: a “statement of finding” for any “not likely” determination, or a final consent order signed by EPA and the PMN submitter. EDF has been able to use this website both to understand how often EPA was making various interim and final decisions, as well as to find out that information for a specific PMN submitted for a new chemical of interest. Beginning around August of last year, however, EPA all but stopped updating this website. Until last night, only a handful of additions or changes had been made to it over the past five months – despite the fact that EPA was continuing to review and make interim (as well as final) decisions on many dozens of new chemicals. EPA simply wasn’t letting the public know about these reviews. EDF raised concerns about this to EPA repeatedly and never was provided with a cogent response as to why EPA had halted informing the public about its reviews. In each of these cases, EPA’s initial review had raised sufficient concern to warrant potential issuance of a legally binding order or at least further review. In the first example, EPA had found that it had insufficient information about the new chemical. In the second example, EPA had found that the new chemical may present an unreasonable risk of injury to health. And in the third example, EPA acknowledged that some factor had triggered the need for a more in-depth review (EPA’s so-called “standard review”). Despite EPA’s initially duplicating rather than replacing or overwriting these examples, its intent is now quite clear: to prevent the public from knowing when EPA’s professional staff flagged any concern in their initial review of a new chemical. Indeed, we already face that very situation for the 120 or so newly added PMNs to the website [UPDATE 1-8-18: As of today there are 126 PMNs with this interim status]. All the public knows is that a “Focus Meeting Occurred.” Gosh, that’s helpful. by not imposing testing requirements on the PMN submitter, given that testing can be required via issuance of an order but cannot be required via a SNUR. So EPA’s changes to its website conceal from the public when a concern is initially identified because in the end EPA plans to do everything it can to give that new chemical its stamp of approval without issuing an order to address the concern. In short: This change dramatically limits the agency’s accountability to the public, not to mention transparency. Is it any wonder the public’s trust in the implementation of TSCA by this Administration is in freefall? This entry was posted in Health Policy, Industry Influence, Regulation, TSCA Reform and tagged Lautenberg Act, New chemicals. Bookmark the permalink. Both comments and trackbacks are currently closed.